OpenStack Horizon is a web based interface for managing OpenStack clouds. Just like many other OpenStack components, it's implemented in Python and uses the Django framework. Sometimes you might notice that Horizon is sluggish and slow and it's not obvious what causes this. Natural thing to do in this case is to profile it to see problematic points. 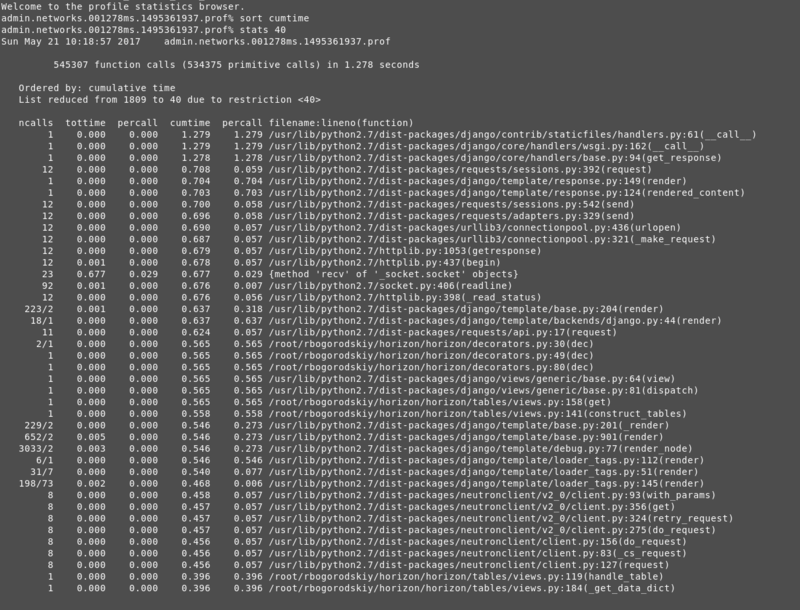 Use standard Python profiling facilities like cProfile. I recommend using the latter and I'll elaborate on that a little later. I think it's a good idea to profile Horizon in the same environment where you run your stage Horizon, i.e. pick one of the nodes where you have Horizon installed already (e.g. configured to be served using Apache) and bring your own instance of Horizon with the same configuration, but on a different port and using Django's built in http server. This way your brand new Horizon instance will be available on port 8000. Also, you might want to check iptables configuration that it actually allows connections to this port. Note: We're not using virtualenv because as we're running this on a Horizon node, we have all the dependencies installed via system packages. Once this instance becomes accessible, we can start actual debugging. Note: looks like --prof-path doesn't decode "~", so have to pass the full path. Now Horizon is running in profiling mode, so we can open it up in the browser and navigate to the problematic pages, for example "Admin -> System -> Networks". Here you can get an idea how much time was spent in template rendering, Neutron client, etc. Also, the documentation stats that osprofiler is different from cProfile in a way that it skips random Python calls, however, it's not hard to strip those from the .prof file (but why would you need to do that though? ), and it doesn't look like an advantage to me. Maybe it makes more sense for profiling components like Nova or Neutron though.